I’m trying to figure out what is important in my life. What is the most important parts of your life? What makes your world go round? What makes your heart sing? Lots of circles on the left page – after reading a prompt over at Inspire me Thursday that I didn’t post in time. But today it feels right with circles. – The blog Dispatch from LA and miss Moss’ visual journal galleries! 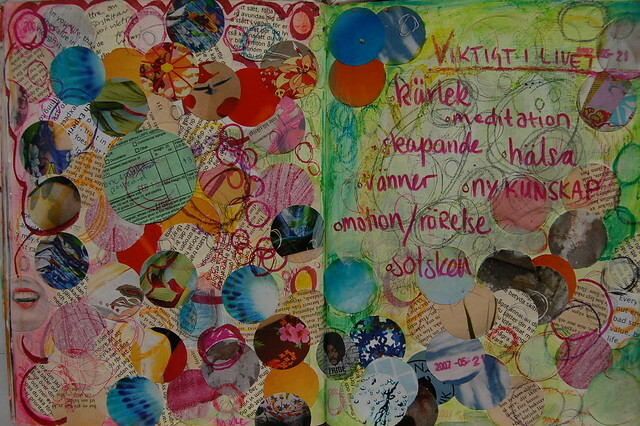 This entry was posted in Art journaling and tagged art journal peek, blog love, circles, cut + paste. Bookmark the permalink.